In Regional Action, an abundance of teams held off on throwing their ace on Friday to save them an anticipated winners bracket matchup on Saturday. Here’s a look at how the top MLB Draft pitching prospects performed on Saturday. Danny Hultzen – LHP – Virginia – Jr. 7IP 3H 1ER 1BB 12K. (W, 11-3). Hultzen is in the mix to go #1 overall. Trevor Bauer – RHP – UCLA – Jr. 9IP 6H 1ER 2BB 14K. (W, 13-2). Now has 203 K’s in 136.2 IP. Strasburg had 195 in 109IP in 2009. Jed Bradley – LHP – Ga Tech – Jr. 7.2IP 8H 2ER 1BB 4K. (W, 7-3). A lefty with good but not dominate stuff, Bradley will go in the 1st round Monday. Taylor Jungmann – RHP – Texas – Jr. 5.2IP 8H 7ER 2BB 3K. (L, 13-1). Kent State gives Jungmann his worst start in a year where he’s been more consistent than nearly any other pitcher. Jungmann is still secure in his 1st round status. Matt Purke – LHP – TCU – So. 5IP 2H 2ER 2BB 6K. Potential #1 overall pick when the season started, has been injured and less than sharp this season. This 83 pitch outing, though ultimately a TCU loss, could help to salvage his draft status. Sean Gilmartin – LHP – Florida State – Jr. 7IP 12H 5ER 2BB 6K. (W, 12-1). Been linked to Cincinnati as high as the 1st round. Andrew Chafin – LHP – Kent State – So. 8.2IP 4H 3ER 2BB 8K. (W, 8-1). In huge win at Texas. While the Longhorns aren’t known for their bats, this was a big stage for the draft eligible sophomore and maybe enough to get him into the first round. Evan Marshall – RHP – Kansas State – Jr. 3IP 2H 0ER 1BB 5K. One of the better right handed relief pitchers in the draft could go in the 2nd round and move quickly. Burch Smith – RHP – Oklahoma – Jr. .2IP 3H 3ER 1BB 0K. (L, 10-4). The JUCO transfer had a good year but got shelled by Oral Roberts. Possible 2nd rounder. Chris Reed – LHP – Stanford – Jr. 1.1IP 0ER 1BB 0K. (S, 9). Serves as the closer for Stanford, Reed could start as a pro. Will be off the board in the first 3 rounds. Grayson Garvin – LHP – Vanderbilt – Jr. 6.2IP 7H 2ER 1BB 7K. (W, 13-1). I like him more than the scouts seem to. I’d use a top 50 pick on him but he’ll likely go later. Noe Ramirez – RHP – Cal State Fullerton – Jr. 8IP 4H 1ER 2BB 12K. (L, 8-4). Underpowering RHP makes up for his lack of dominance with polish. Fastball command and a plus change up could make him a 2nd round pick. Cory Mazzoni – RHP – NC State – Jr. 8IP 4H 2ER 1BB 12K. (W, 6-6). A respectable ace in the ACC, Mazzoni should come off the board before round 5. Adam Morgan – LHP – Alabama – Jr. 5.2IP 11H 8ER 3BB 5K. (L, 5-7). Results never seem to match the skill set. Will be off the board before the 5th round. Nick Maronde – LHP – Florida – Jr. 1.1IP 1H 0ER 1BB 1K. Like Kevin Chapman before him, Maronde could be a high pick as a left handed relief pitcher and could move quickly. Kyle Simon – RHP – Arizona – Jr. 9IP 4H 0ER 0BB 6K. (W, 11-3). Will get picked in the 5th-7th round range. Ross Stripling – RHP – Texas A&M – Jr. 9IP 4H 1ER 2BB 5K. (W, 13-2). Stripling should go before the 8th round. Sam Gaviglio – RHP – Oregon State – Jr. 9IP 5H 1ER 2BB 11K. (W, 12-2). Baseball America considers him a 5th-6th round talent. Jordan Pries – RHP – Stanford – Jr. 7.2IP 2H 0ER 0BB 6K. (W, 6-5). Huge win for Stanford over Cal State Fulerton. Pries could go around the 10th round or so. 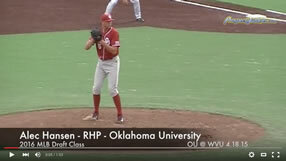 Patrick Johnson – RHP – North Carolina – Sr. 8IP 3H 0ER 1BB 11K. (W, 12-1). UNC was granted a cupcake of a regional and Jonson was dominate against James Madison. He’s a modest pro prospect who might not hear his name called until the 20th round. But I’d be happy to have him in my system.